A portable NGS platform would drastically improve the efficiency of diagnosis and stem the spread of infectious disease outbreaks such as Ebola. You’re a physician working in West Africa for Doctors Without Borders, and a child has been brought into your clinic who is febrile and complaining of a headache, fatigue, and malaise. Given your locale and the current season, two of the most probable diagnoses would be either malaria or Ebola. While neither disease provides a positive prognosis for the patient, Ebola has the capability of spreading rapidly to many other individuals and would require quarantining as soon as possible. Time is of the essence, but so is accuracy as the panic of an Ebola infection would spread even faster than the disease itself. Moreover, should your prognosis prove wrong and the child actually have malaria, any Ebola therapy would be completely ineffective. These are real scenarios that many physicians have to face daily and not just in underdeveloped parts of the world. Infectious diseases could just as easily spread (and have) through hospitals, schools, cruise liners, and food preparation plants. While our current monitoring systems are relatively effective at isolating and identifying the offending microbe during an outbreak, speed is always a most welcome ally in the diagnostic instrumentation realm. Having the ability to be able to identify not only the etiological nature of an infectious outbreak, but also the species, strain, drug resistance profile, and genomic abnormalities associated with the offending microbe in real time would be invaluable for providing information to clinicians and public health workers. Techniques such as PCR, differential culture media, and ELISA assays have all proven to yield results that provide fairly accurate clinical assessments for infectious disease outbreaks, but all are inadequate for providing answers in real time, many taking several days in order to receive accurate results. Next-generation sequencing (NGS) platforms are beginning to be utilized more frequently to fill in the gaps left by the aforementioned diagnostic tests. While NGS platforms can provide a veritable mountain of data on an infectious agent, they too run into the same temporal issues as most other tests—not to mention the considerable expense to own and operate these systems. So, is there a technology available that can provide a large amount of data on an infectious agent and operate in real time? Several up and coming companies think so, and they are putting it all on the line for the innovative, relatively new technique called nanopore sequencing. Nanopore sequencing is a relatively simple but elegant technology, capable of reading long stretches of native (unamplified) DNA with little processing involved. Essentially, a small pore roughly 1 nanometer in diameter (about 100,000 times smaller than the width of a human hair) that is made either by a biological molecule, such as α-hemolysin, that traverses a membrane or by “punching” a pore through a solid support using an ion beam. The system is then bathed in a conductive fluid and a voltage potential is applied across the membrane-pore complex. As each DNA strand or single nucleotide is electrophoretically driven through the pore, the current fluctuates and is picked up by a detector allowing the sequence or nucleotides to be read. In recent years nanopore sequencing has seen a surge in interest, due in large part to the MinION sequencing device from Oxford Nanopore Technologies (ONT), the U.K.-based sequencing company that has been leading the charge to deliver nanopore sequencing to the masses. The MinION is portable sequencer about the size of a large USB flash drive designed to provide real-time sequencing results for smaller genomes from organisms such as bacteria and viruses. While interest in this technology has seen a rapid spike in interest of the past several years, nanopore sequencing is a not a new concept, as an original patent for a nanopore device was filed by George Church, Ph.D., renowned geneticist and professor at Harvard and MIT, back in 1995. While his design was different than what was ultimately created by ONT, the general principal remains the same. Early on, nanopore technology was not widely accepted and many scientists believed it impossible to even create an instrument capable of performing the functions that the initial visionaries had conceived. After several years and many failed attempts later, scientists like David Deamer, Ph.D., professor of biochemistry at the University of California, Santa Cruz, were able to measure changes in voltage for nucleotides traversing a nanopore channel. Dr. Deamer looked toward an engineering solution, capturing DNA in a single specified place, for what was essentially a chemistry problem, i.e., being able to manipulate DNA molecules in solution. Many skeptics along the way said that nanopore sequencing couldn’t work, that the biophysics for the concept was wrong. Others thought that it was just too difficult a problem to solve. Moreover, after some setbacks and glitches from the initial breakthroughs, many in the life sciences began to compare the technology to the hollow promises that some physicists expounded about cold-fusion. However, as is typical in many of these tales about dreamers triumphing over the naysayers, perseverance and some timely influxes of funding, from places such as ONT and the NIH, nanopore sequencing began to make its way from cobbled together devices in academic laboratories to user-friendly technology designed for the masses. In June of 2014, researchers from the University of Birmingham, U.K., posted on Figshare the first read of an almost 9 kb DNA sequence that aligned to Pseudomonas aeruginosa, using the MinION nanopore sequencer, proving the point that nanopore sequencing not only works, but is applicable to identifying potential infectious disease outbreaks, as P. aeruginosa is a common cause of hospital related infections. 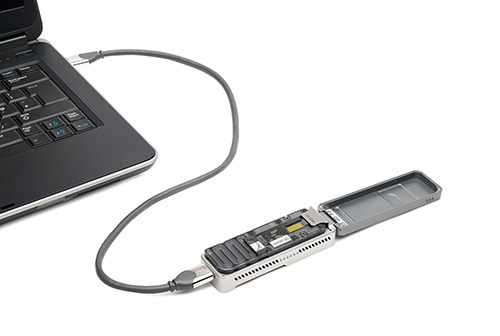 The MinION device from Oxford Nanopore features a flow cell, sensor array, and integrated circuit that is powered through a USB connector to a laptop. Within a few weeks of posting the P. aeruginosa sequence, the University of Birmingham group was called upon by a local hospital to help understand the nature of what was thought to be an outbreak of Salmonella spreading through the facility, affecting around 30 patients and staff members. This was not a typical request to provide data within a few weeks for analysis. The hospital administrators wanted the results quickly, like FedEx’s next day delivery, so that they could better comprehend what they were dealing with and get the infection under control. Luckily, the Birmingham researchers had a nanopore sequencer at their disposal and thought it would be best suited for the task. Within 15 minutes, the device was able to detect Salmonella DNA in some of the samples the hospital sent. Within two hours, the investigators were able to determine that of the 16 samples they received, the majority of the bacterial strains were all part of the same outbreak. After comparing the sequences they obtained to those contained within public-health databases they were able to link several other cases together and find the source, an egg supplier in Germany. This was a clear demonstration that due to its simplistic design, low sample manipulation, ability to provide long sequence reads and overall speed, nanopore sequencing represented the ideal diagnostic tool for infectious disease testing. If we turn back to our patient from the beginning of the story, we can see how the speed of a nanopore sequencer would be instrumental for that scenario. Not only would it be able to distinguish if the patient had Ebola, it could also rapidly determine the strain and source of the virus. That is precisely what occurred this past April in Guinea and other parts of West Africa when teams from the European Mobile Laboratory Project (EMLP) and the NIH took some nanopore sequencers to the frontlines of the Ebola epidemic. Using the MinION nanopore sequencer, the EMLP team read the genomes of Ebola from 14 patients in 48 hours. The researchers were able to help the physicians diagnose Ebola patients and rapidly assemble phylogenetic trees to determine where the infections were originating. While initial trials using the nanopore sequencers have been positive, there is still much the sequencers can’t do. Currently, the smaller devices like the MinION are not suitable for larger eukaryotic genomes or ones with a nucleotide bias that would contain genetic stretches of the same DNA base, e.g., poly A or T stretches. Additionally, current nanopore sequencers produce a higher error rate than current NGS systems, which will most certainly be addressed in future design iterations. 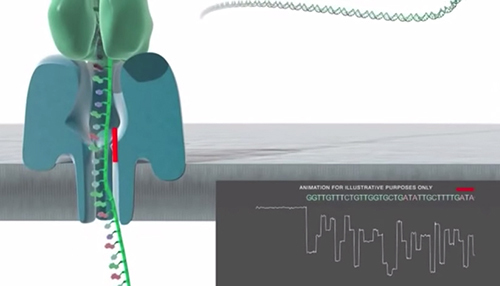 So, should you throw out your current NGS system and replace it with a nanopore sequencer? Perhaps not just yet as the technology still has a few steep cliffs to scale before it can sit atop the already crowded sequencing mountain. Based on recent usage of the technology, nanopore sequencers certainly seem very capable of being able to perform at the front lines of an infection hot zone, providing valuable data to medical personnel. This article was originally published in the July 2015 issue of Clinical OMICs. For more content like this and details on how to get a free subscription to this digital publication, go to www.clinicalomics.com.